Honey Kiss melons have a light crisp texture and are incredibly refreshing and sweet, with a lightly netted distinct yellow skin. They are light salmon colored and are oval in shape. 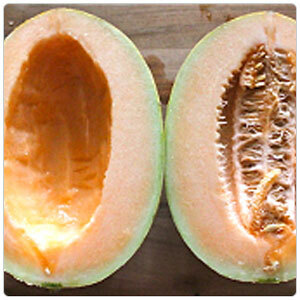 Some melons develop brown spots (sugar spots) due to their high sugar content. Honey Kiss is a new exclusive Hami melon variety. The Hami melon originated in the northwest province of Xinxiang in mainland China over 700 years ago and has been popular with the Chinese for centuries. It is said that the Hami melon was not originally produced in the Hami Prefecture but in nearby Shanshan. Because King Hami sent it to the Qing Emperor as a tribute, which praised the fruit greatly for its incomparable honey aroma, the melon was so named "Hami melon." In China the Hami melon is called the "King of Melons" due to its sweet honey aroma, high vitamin content and medicinal value.